Located in the revolutionary BOXPARK pop-up mall in Shoreditch London, PUMA opens a new concept store, called “TWENTYONE.” This new concept shop will offer new stock and organize events and promotions every 21 days. Visitors will be welcomed with a menu board at the entrance highlighting the 21 exclusive footwear options offered in store. Keeping in line with its ecological principles and BOXPARK’s inventive approach on building sustainable structures by means of container vans, each pair of shoes will come in PUMA’s Clever Little Bags and highlight some icons from the PUMA Eco Table that indicates the eco-friendly materials utilized. Since 2008 in Alicante, Spain, PUMA have been constructing portable spaces which house retail spaces, bars and decking areas. These spaces are called Puma Cities. 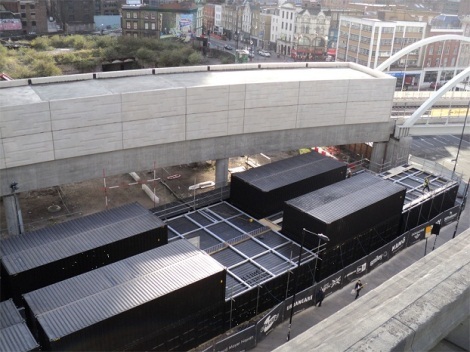 It is a mutual love for container architecture that pulled PUMA and BOXPARK together. Being one of the first major brands to experiment with this concept made it feel right for PUMA to support this. A fantastic opportunity to enlighten consumers with PUMA’s most iconic and innovative products through a total brand experience.